Along with the growth of your personal expertise, the main objective of the Executive MBA studies is the development of your organisation. The modes of study support this objective; you are evaluated on the basis of how well you have been able to apply what you have learned from your company's perspective. 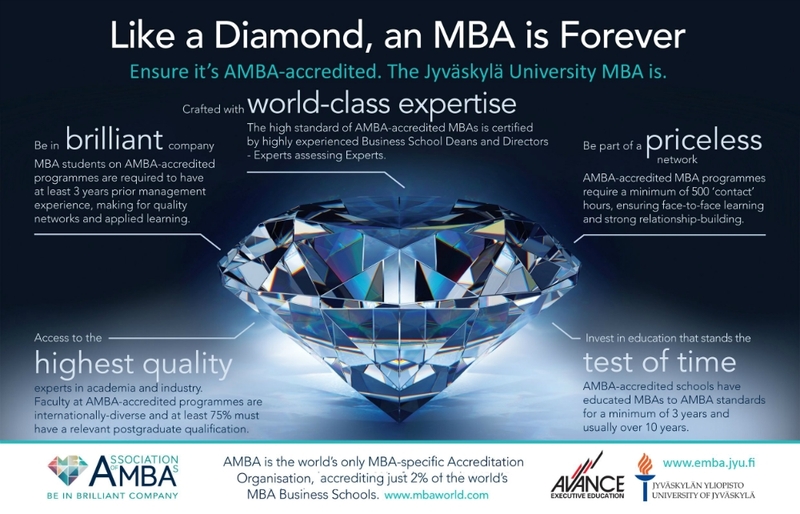 During this extensive university-level MBA programme you will obtain a multidisciplinary approach to business. The aim of the programme is to develop your operational skills as a manager and increase your confidence in seizing new, more demanding challenges. Concrete benefits of the EMBA studies for your company are the numerous development assignments that can be applied directly to your own business, and particularly your EMBA thesis. The topic of the EMBA thesis can relate to strategic planning, account management, sense of community at work, development of leadership, financial management, the new concepts of e-business etc. We keep the written assignments and reports produced during the studies strictly confidential. The produced material will not be published or disclosed to a third party. You can take your EMBA studies flexibly alongside work and you will have the direct benefits immediately at your disposal. All your development assignments and projects can be linked to the operations of your own organisation. During your studies you will join a dignified, wide-ranging network of managers and experts. You can utilise the goal and career-oriented network both during and after your studies. 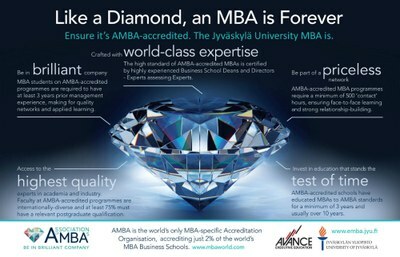 You can start your Executive MBA studies at a time best for you. Should your job description or situation in life change during your studies, it is possible to alter your curriculum flexibly throughout your studies. "MBA programmes must maintain the highest quality and also be current with changing trends and innovation in all industry sectors."